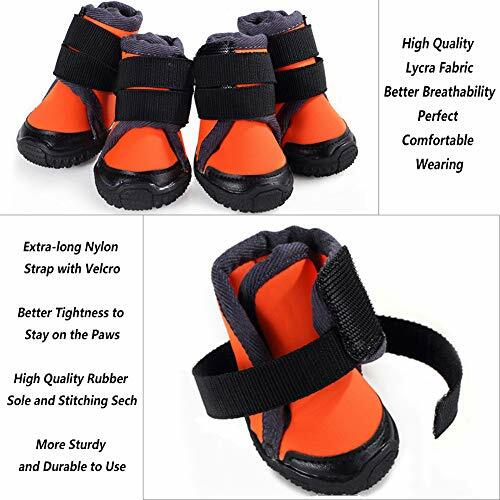 This pair of pet boots will serve as a good partner for your dog, protecting his / her paws against injury from sandstone roads, ice & hot pavement, sharp grass, etc. The sole of the dog shoes is waterproof, robust, flexible and non-slip. They are tough enough to withstand outside play and protect your dog's paws from stones, dirt and mud. So that your dog can walk and run indoors or outdoors, in wet and dry, hot and cold conditions. The dog shoes are attached with magic sticker that are long and adjustable, prevent slipping and provide a custom tightness for a secure closure. The reflective color keep your dog conspicuous outdoors. ★★ Now click « Add to Cart », let your pets own this handsome boots now!!! * Please allow slight error of measured data. * Only the soles are waterproof, the dog boots can not be used in deep water. * Please measure the size of your pet's paws before purchasing, the data in the size chart shows the inside size of the shoes. ❤️️️️️❤️ Non-slip soles, dogs will not slide when walking on wet roads. ❤️️️️️❤️ Magic stickers straps, easy to wear, not easy to drop down, suitable for all size dogs. 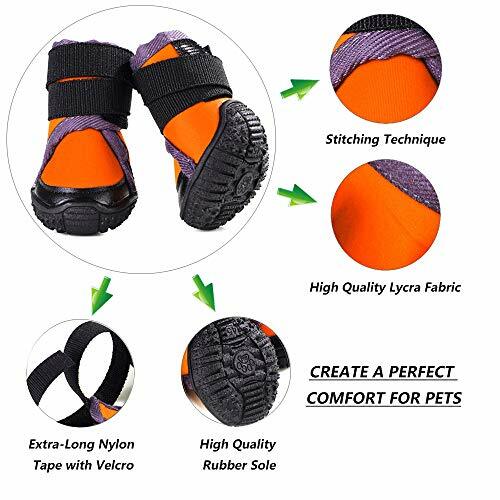 ❤️️️️️❤️ Softy lycra fabric, comfortable and flexible, breathable and will not bored the paws, your dog will not feel stuffy for long time wearing sports. ❤️️️️️❤️ Effectively protect the dog paws from hot pavement, snow, ice, high temperature, stones, glass, and etc. It's suitable for a variety of outdoor activities, and it also can wear indoors to protect furniture. ❤️️️️️❤️ Please measure your dog's paws before purchasing, if the measured size is between two sizes, please choose the larger one. 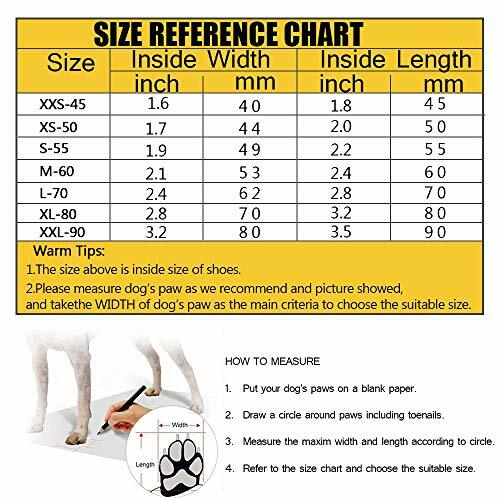 And if your dog has fatter or wider paws and its size is very close to our size chart data, then you might need to choose one larger size to fit your dog's paws.